As the volunteer numbers were very small on Saturday 30 June, there were no spare people to help round the Children's Playground and Croquet Pavilion. So Alison Carr nobly volunteered to respond to Heather's cri de coeur on Monday morning instead. Heather was joined by Kiersten (from the USA, in Edinburgh for two years and a volunteer with Edinburgh Garden Partners), and her two children Madeleine and Ty (5 and 3), who did a lot of good work in spite of the temptations of the nearby playground. This consisted of litter picking, path edging (tough work done mainly by Alison), using the gathered grass to patch worn edges, and collecting weeds, leaves and twigs (two bagsful for the Council to collect). A gardener who works for the Croquet Club also appeared, did some litter picking, and produced a big basket for leaves, which he will compost. It was good to have some help from the Croquet Club: we hope this will set a precedent. Perhaps providentially the weather was not so hot as on Saturday, so more comfortable for strenuous work. Also on the 'to do' list was weeding round the playground, but there were quite a few children there, since school has broken up, and this very important job was postponed. The litter-bins opposite the playground were overflowing and the gulls had been at them and scattered stuff around: sadly no time to rectify this yet. Only about a quarter of the necessary path edging was done: but at least we made a start, with good results. Plenty more work for next time! On Saturday 30 June, four volunteers met at the Cricket pavilion and decided that watering young trees was the priority. So we filled the bowser and started by watering the five apples in the Community Orchard. Then Bob and Anne heroically started rescuing the thirsty cherries along Jawbone Walk, helped by Alison after she'd cleaned the Acquroff fountain and filled the bird bath. We look forward to further rescue work next session! 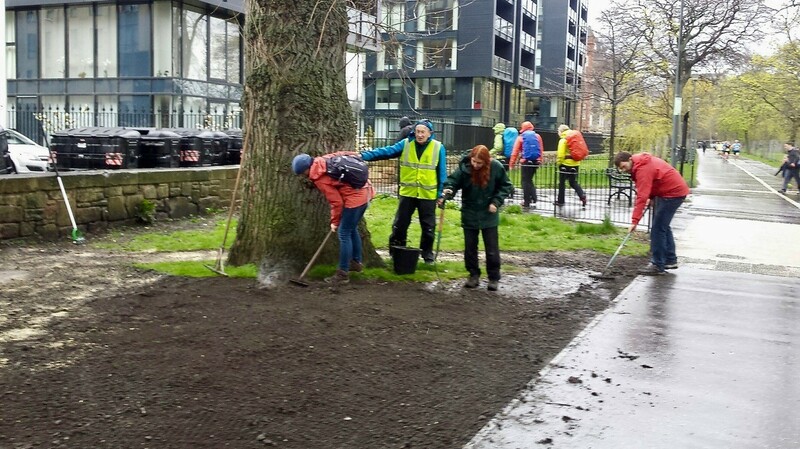 We had a very successful work party on 28th April with 8 volunteers braving the rain. A very worn area at the bottom of Chalmers Street was raked and seeded—let's hope the grass grows! The grip of winter was overthrown for a day this January 27th, as a substantial task force got outside and set to work for the monthly FOMBL volunteer work party. The initial forecast was bleak, but this didn’t put our volunteers off – many turned up in raincoats and waterproofs, but these were quickly cast aside as the sun came out for what turned out to be a rewarding day for all. Over the past couple of years, many of the young trees in the Meadows and Links have started growing too big for their wire cages, and are at risk of becoming damaged by them. A big task for the day was to make a start removing these. Regular volunteers Tim, Andy, Maureen, Neil, Bob, Martin were joined by new volunteers Anne and Ludovica, to form a serious tree-freeing task force. Armed with bolt-cutters, screw drivers, wire cutters and all manner of tools in between, the team rapidly set to work and managed to remove x wire cages in just 2 hours, allowing the trees within to breathe and grow freely again. We were greatly helped by Andy using his trailer to take away the heavy supporting posts. This task proved slightly addictive – in fact a small group of us couldn’t resist removing a “bonus” cage on the way back to Heather’s for lunch! Meanwhile, a smaller but no less formidable unit of Heather, Alec and Catherine set to sweeping and clearing up the substantial amount of leaves that were piling up around the hedge and fence of the croquet pavilion, and becoming a litter trap. 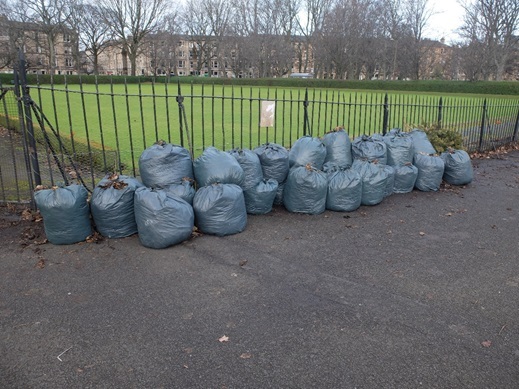 Over the course of the morning they filled up a whopping 30 bags of leaves and x bags of litter! Leaf piles have a habit of magically producing many oddities, this time including a Christmas tree. The bags have now been collected by the council to be composted. We finished with a delicious lunch of Heather’s famous carrot and coriander soup, served with hearty amounts of bread and cheese, with juice or even a cheeky glass of wine. Good work, good food, good company – what more could you ask for from a Saturday morning? Maybe you should come along next time! A small but select group assembled at the Cricket Pavilion at 10.00 a.m. in glorious sunshine, collected tools from the shed and made their way to the area near the Croquet Pavilion, to complete the work begun last time. Our Volunteer Co-ordinator Yusef was not able to come, so the rest of us did our best. Present were Ellie Corsie, Alec Mann, Maureen Parnell (for the first time), Joan Carter, Catherine Dickie, and Heather Goodare bringing up the rear (very slowly these days). Ellie had to go at half time, but was replaced by Robin Morris, in really good form after his recent hospitalization. We were sad though not to be able to welcome Jimmy Forrest, the Park Ranger, who helped last time, but is now in hospital after an accident. We wish him the very best for a full recovery. We did a thorough job round the children's playground, clearing weeds, which went into several large black bags for collection by the Council for composting, and also grass, which we recycled onto bare patches near by. It is sad to see that weedkiller has been used round the playground, but will no longer be needed around this site this year: Council please note! Then followed nearby path edging, making several paths considerably wider, and again enabling us to fill in bare patches with new grass. The weeding under the nearby benches was also completed. We had a few encounters with passers-by, who praised us for our work and were given FOMBL leaflets and encouraged to join. Altogether a good morning, though it would have been nice to have more volunteers. A modest yet determined troop of volunteers assembled on the Pavilion café at 10:00 on Saturday for a good day’s FOMBLing. Tim, Joe, Catherine and Ellie had a good workout in raking the cuttings from the “naturalised grassland” area on Leamington Walk. This area is part of the Edinburgh Living Landscape programme, a network of sites designed to support biodiversity across the city. This particular area had in recent weeks become quite dominated by dock, to the detriment of other species and to the displeasure of some locals. By raking off the cuttings we should reduce the nutrients in later years, hopefully allowing other grasses and flowering species to thrive and enhancing this area for all in the future. Meanwhile, Heather and Yusef continued some path edging work around the croquet pavilion. This felt a bit like an archaeology expedition at times, as a fine, invisible paved edge was unearthed from under the creeping turf. Eventually, largely due to Heather’s grit and determination, a whole segment of edge was restored, and the resulting turf used to patch up bare areas. Margot did a great job of trimming back the privet hedge that is engulfing the benches by the tennis courts, and Robin did a large amount of litter picking, particularly around the sundial. The day ended with a hearty lunch - Heather’s famous carrot and coriander soup, cheese and a glass of wine, much to the volunteer’s delight. Hope to see you all next time! The sun was shining, blackbirds were chirping and bees were buzzing in the wildflower patches. In short, a fine day for a morning’s “FOMBLing”. We had a good contingent of around 9 volunteers this month, and were also joined by park ranger Jimmy who was a great help. Yusef, Heather, Martin, Derek, Vivian and Jimmy (later joined by Sarah) focused their efforts around the croquet pavilion, where there was much to be done. The benches facing the children’s play park were slowly being engulfed by encroaching turf and weeds, as was the fence of the play park itself. Meanwhile, what looked like several years’ worth of leaf mould was slowly putrefying by the croquet pavilion fence. Derek and Martin made short work of the leaves by the croquet fence, rapidly filling up several large bags, while everyone helped out in clearing the weeds and turf from under the benches and creating a clean edge to the lawn behind them. Later on, Jimmy and Martin cleared all the weeds from under much of the play park fence. There remains a good deal of work to be done around this area – but at the end of the day the volunteers could look at their work and take satisfaction at a job well done. Meanwhile Neil took a group of volunteers ( Joan, Sarah, Alec, Kay, Margo and Andy) and up to the South Links where they did a great job cutting away Elm base growth which had spread over the side of the pedestrian path. Andy joined the group and took a huge pile of cuttings to the Council recycling at Dalkeith Rd. They also pruned back an Elder which promises a huge crop of berries. Much more work needed but great start. After the work party, Heather treated volunteers to delicious homemade carrot and coriander soup at her house, with sandwiches kindly provided by Scotmid. All in all, a rewarding day. Hope to see you all next time! We met at 10.00 a.m. at the Pavilion: Yusef (volunteer coordinator) Neil, Heather, Martin, Catharine Dickie, Suzanne Mackenzie with her two young sons Jacob and Connor, and Conall, their friend. Patricia Edington from Scotmid was hoping to bring along some volunteers: these didn't in fact turn up, but Patricia's contribution of a lot of hard labour plus a wonderful picnic package of sandwiches and bottled water from Scotmid was most welcome. Joe joined us later. The boys then had their snack, and headed over to the Sundial with Heather and Suzanne, where they did a great job cutting away the grass which had already overgrown the beautiful new setts, using the salvaged grass to mend nearby barbecue burns, of which unfortunately there are plenty, even in the middle of the nearby cricket pitch. Heather picked up a lot of broken glass around the Sundial itself: it looked as if someone had deliberately broken a bottle against the railing. Yusef kindly volunteered to sweep up the remaining tiny pieces with a broom from Wright’s Houses. Patricia and Catharine had meanwhile taken into their care the Helen Acquroff Memorial Fountain, which was surrounded by weeds: on the side of the Pavilion Cafe the fountain was being engulfed by a man-high troop of thistles and nettles. These were briskly removed, gathered up and piled inside the fence at the west end of the enclosure. It was noted that there was no obvious place to put material to be composted: this is something we need to address with the Council. Meanwhile there was an attempt to get the new bowser going, but the right spanner was not available, so this job was delegated to Joe and Yusef for later in the week. However, the total available supply of new turfs at the Community Garden was then relocated by the remaining work force to bare patches alongside seats or in barbecue burns. Heather did her usual obsessive litter-picking, assisted by Suzanne. Neil left the Pavilion to work in the South Links. He removed damaged tree branches caused by the Council mower. 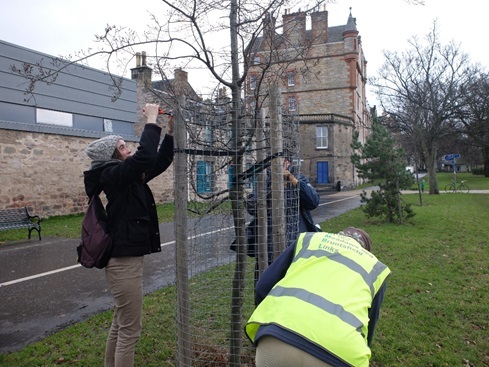 He also removed the mesh tree guard around the conifer at the pedestrian entrance opposite Warrender Park Rd. This was because the mesh was stopping and killing branches, which couldn’t form naturally. He also cleared the undergrowth under the tree. Martin also did a lot of feathering, and set up the water supply and access for bowser. Altogether a fruitful morning: many thanks indeed to Patricia for the picnic. We look forward to seeing her next month as well, accompanied by volunteers. On 29 April, FOMBL volunteers met at the Community Garden site to give the Garden volunteers a hand in implementing Phase One – clearing the turfs, digging trenches for potatoes and erecting the first raised bed. While a group of keen woodworkers got to work with the cut timber, others dug over the little vegetable patches, and removed rubble. Then they dug trenches and filled them with compost. 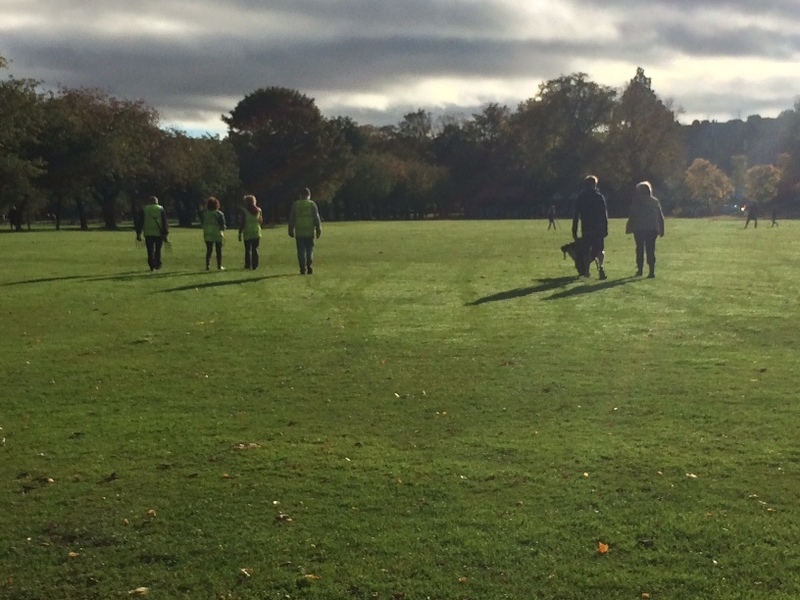 Other FOMBL volunteers did some heroic litter picking, and yet a further group used the turfs to repair burnt and damaged sections of the grass on the Meadows. When the raised bed was up, everyone got busy filling it with compost, and the first herb, a rosemary, was planted with due ceremony. Donations of herbs welcome. The potatoes will be planted by children from Sciennes Primary School on 2 May, and volunteers from Trees for Cities will plant the Community Orchard on 5 May. Phase One is well under way! Many thanks to all our helpers. Volunteers: 16 overall including Tim, Andy, Kay, Alec of the regulars. Hello everyone, and thanks to those who could make it to the work party. We did it! We got the seed sown for the wildflower patch, one of our most ambitious projects to date. Expanding it by 130m2 was no mean feat, but thanks to the hard work of our members and the council, it’s done. The turf we removed (rather than drown it in glyphosate) has gone to patch the areas around Jawbone Walk which were trampled to mud during the renovations, and Heather even found the time to pick some litter. The weather was beautiful, and it was lovely to see so many people put in so much work. I can’t wait for the result. Our next work party is on the 29th of April, and I hope to see you all there! Hello everyone, and thanks to those who could make it to the work party. This was a bit of an unusual work party in that we weren’t working on the Meadows themselves, but in the basement of Edinburgh Student Housing Co-op. We were building bird boxes from reclaimed material, and got a good workflow going. We ended up with five bird boxes, which are yet to be allocated to any particular park or garden. The weather seems to have affected the turnout, but hopefully this becomes less of a factor as we head into spring. I’m happy with how our boxes turned out, and the idea of building more is very appealing, particularly for the summertime. Unfortunately, the session could have been more child-friendly, and this will be incorporated into future plans. Our next work party is on the 12th of March, and I hope to see you all there! There will be another March party on the 25th. Volunteers: 13 overall including Andy, Alec of the regulars. Hello everyone, and thanks to those who could make it to the work party. This month's was a relatively nondescript work party of leaf raking and litter picking, but a heroic effort in spite of some chilly weather. 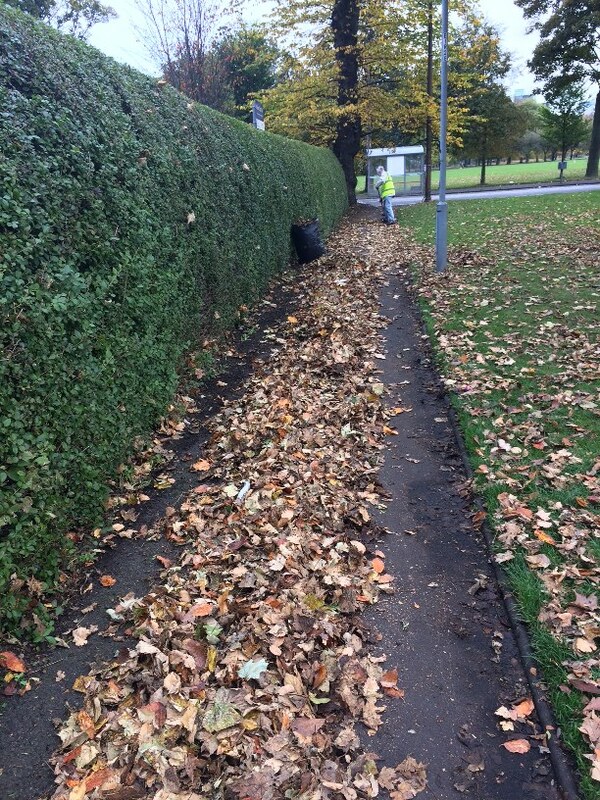 We ended up with bins full of leaves, and plenty of rubbish out of the park, particularly around the croquet lawns. We had a few passersby stop to say hello and ask what we were doing, which is always nice, and hopefully expands our reach a little for future projects. Feathering of tree trunks was also done, as well as pruning of shrubs, and to my delight a tree stump on the grass in front of our flat was feathered, ready for planting with flowers (if someone can gouge out the innards and supply soil). Luckily the promised rain held off till the afternoon, so the work was accomplished in relative comfort. In the end it seems that the enthusiasm of FOMBL volunteers is unquenchable. This augurs well for future work parties, and the steady improvement and maintenance of the Meadows and Links. This is also perhaps the moment to tell you all that finally some of the money from the Underbelly event during the Festival last August has been made available for future projects on the Meadows. 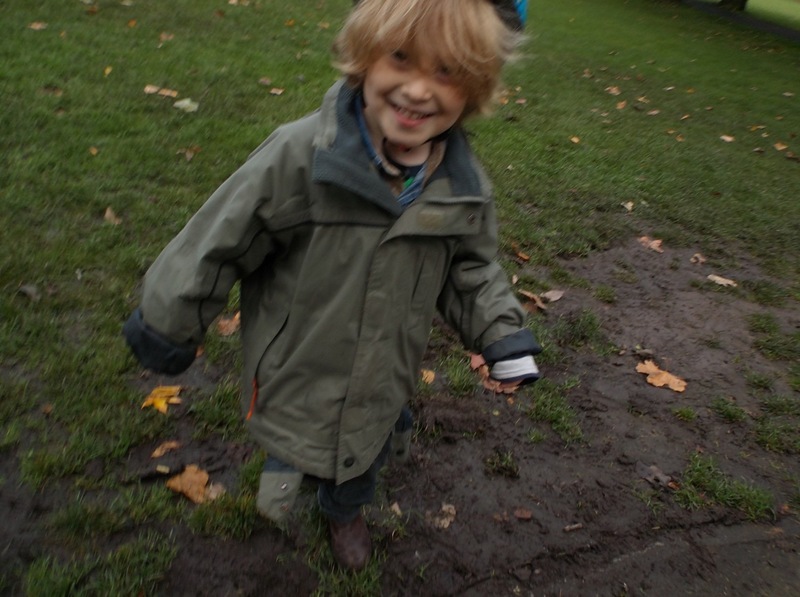 Neil Roger (one of our Trustees) is in charge of our 'wish list', which includes an exercise trail, a Heritage trail (with information boards for our treasured monuments starting with the Sundial), more children's play equipment, and work on the railings. So a very happy New Year to you all, and many thanks indeed for your support. Volunteers: 26 including Jimmy the Ranger, some regulars, some ESHC people, and an enormous group of Evolve volunteers (10-15). Hello everyone, and thanks to those who could make it to the work party. Our main task for the day was planting a row of Crocus and Narcissus bulbs on the bank outside Wright’s Houses. Being this year’s last major work party, it was also a nice rounding-off on a personal level, as planting bulbs on this strip is the reason I first got involved with FoMBL back in March. Alongside this, we had a sweep of some of the leaves by the croquet greens to give the grass a chance to breathe. We had a solid day’s planting along the bank, with some litter-picking and weeding as we went. In the end, we planted all the bulbs we had and have now got something nice to look forward to in the spring. 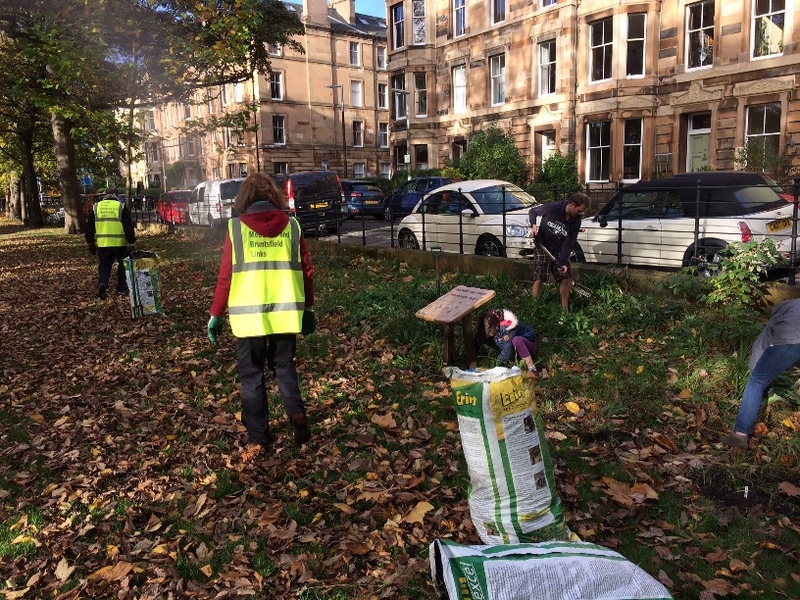 A small offshoot of our eVOLve volunteers sorted out the leaves at the croquet green and did an excellent job. We hope to see them again as their positivity had a great impact on what can be a dull morning’s work. Though we only had two jobs on and there’s not too much to say about either, we had an excellent session overall, and hopefully our attendance stays as high in future. Heather’s running a small work party on the 31st of December, but the rest of us haven’t the mettle stuff and have taken New Year’s Eve off. We’ll be back on the 28th of January, I hope to see you all there! On such a beautiful, sunny Autumn day we started as a small group and decided to work together on the wildflower plot in the West Meadows. Under Sarah’s watchful eye, Tammy, Joe, Aurelie and Alec planted some new seeds with help from Bob and …. clearing the patches. Sarah was kept busy advising the rest of us on what to do and identifying plants with Ann and her 2 sons. The seeds were quickly planted with all hands on deck and we finished up the morning clearing the wildflower plot of overgrown grasses, ready for the new wildflowers to sprout up. We managed to collect over 7 full bags of overgrown grass and vetch with the help of Thomas who came to assist us. While most of the group worked in the wildflower plot, Heather and Tanya (joined by Jimmy the Park Ranger and Mike) cleaned up the Helen Acquroff fountain around the base, extracting a lot of weeds and grass, which we recycled on bare patches. They then did a lot more path edging, again using the grass to make good the bare ground: result much more tidy. Neil was happy to take on the sole job of taking down the fence and stakes for a small tree that was ready to stand on its own, along in Bruntsfield Links. Felicity and Iva, from Wrights House joined us for a coffee break at 11.15am and into the afternoon. Thanks as always to Amanda and the team at the Pavilion Café for our £1 coffees. Coffee was made extra delightful with a big box of chocolates that Heather had kindly brought along and forced us all to finish – it didn’t take too much force. With the wildflower plot replanted and cleaned up, we lost a couple of volunteers at the lunch break. Tammy, Alec and the Wrights Houses group headed to the Croquet Club to pick up a LOT of fallen leaves. As you can see by the photos, this was a big job, but we managed to have some fun with it too. While we managed to clear about 20 bags full of leaves, we run out of time to clear the entire area – a job that no doubt will be ongoing. One particular passer-by must have thought we were doing a great job, as he took several photos of us when he thought we weren’t looking. Hopefully we managed to get the FoMBL logo into one or two of his shots. Heather and Tanya continued working near the Café with Jimmy and Neil and were joined by a small boy called Spiky (apparently according to his Dad named after Spike Milligan). He was very helpful in stamping on the recycled grass to make sure it was well grounded. Two little girls joined in, finding a beautiful long worm, which they made sure was rescued and put safely under the recycled grass. Their Dad was coaching junior football, so Heather gave him a leaflet and a newsletter, drawing attention to the lost football cup. As always, we had a great time and luckily had a lovely day to spend outdoors. The next FoMBL Working Party (and likely the last one for 2016) will be on Saturday 26 November when we will be planting a couple of thousand bulbs near the Wrights Houses. Volunteers: Around 25(!) including Peter the Ranger, some regulars, some ESHC people, and an enormous group of Evolve volunteers (10-15). Hello everyone, and thanks to those who could make it to the work party. We were a little slow to start, as we were waiting for an external group before the brief for the morning. With no sign of them, we decided to get going anyway, splitting into three groups: litter-pickers, path-edgers, and wildflower-patchers. The litter-pickers were the biggest task force (we stole all the Evolve members) and made good use of the excellent bins, which found their way into our shed. We swept over to the tennis courts, and came back with bags of rubbish. Another solid day of nondescript litter-picking, though I did find an entire, unopened tin of baked beans. The path-edgers were an elite squad made up of more experienced Fomblers than I, and their steady flow of turf was evidence enough of their stellar work. This turf was used by a splinter group of the litter-pickers to cover bare patches outside the pavilion café. Sarah was in charge of the wildflower-patchers, and described it as “great fun”. This has been echoed by the volunteers themselves, and it looks like we’ll be sending more volunteers over this month, and again in the spring to help plant bulbs. In the end, we did hear from the volunteer group (Youth Zone) who were also supposed to be joining us, but they’d decided to go home, possibly to return another day. Overall, we had an excellent session, and hopefully our attendance stays as high in future. Our next work party is on the 29th of October, and I hope to see you all there! Here’s a link for the Facebook event for the next work party. PS from Heather: after refreshments at mid-session a small elite group of three attended to the noticeboards in North Meadow Walk that needed cleaning. One of the Perspex windows has now had its scratched surface replaced by Mike Shields with a beautiful new one: hooray! Hi again everyone, I am back this month after a wonderful birthday weekend last month. Again, I want to thank everyone for helping out last month while I was off. This month we got some beautiful weather which made the work all that much better. Everyone arrived quite promptly at 10am to get to work. I decided to focus the work on the East and West Meadows as these two areas have been a bit neglected and the litter was piled deep; remnants from the Festival I can only assume. Litter picking took up most of the time with me in the West Meadows with help from Derek and Joe while they trimmed up some trees along Melville Drive. In the East Meadows, Eileen, Suzanne, Jacob and Connor were busy picking up litter; though no one got all the way to the tennis courts as there was so much to pick up. Heather and Robin stayed at the Pavilion with the intention to finish the seeding from last month, though got stuck into some edging instead; utilising the scraps to do some patching. I believe that Bob did some work in this area also before leaving at coffee time. Alec and Andy did a fantastic job clearing the weeds that were growing fast and thick around the croquet club. Again, this took quite some time and the edging didn’t get started until after the coffee break. The area looked so much cleaner and neater, as I had also done a litter pick near the croquet club and playground. While picking up litter in the West Meadows, it was a nice surprise to hear a “Thank you for taking that rubbish” from a runner-by. While I didn’t get a chance to chat to him, it is good to know that the work we do does go noticed. I think we can sometimes struggle to see any results and feel that we never really get too far. At 11.15am, we sat for our coffee break at the Pavilion Café as we always do. Eileen, Robin and Bob had to leave now, and the rest of us went to finish some tasks. Andy and Alec cleaned their weed scraps and did some extra edging around the croquet club while Heather utilised Jacob and Connor to do the seeding at the Pavilion. Derek, Joe and I ventured to the East Meadows to try and get a bit closer with the litter eradication and were kept busy right up until 12.30pm when we stopped for the day. We were lucky to have Park Ranger, Peter with us for the day offering assistance and support. Our FoMBL equipment is now secure in the shed that Andy provided, and we now have it all locked up tight. Our next working party will be Saturday 24th September. Next month we will require some volunteers to help Sarah in the Wildflower plot which will be a nice change. Don’t forget your gloves and £1 for coffee! See you then! Modest in number yet determined in will, the FOMBL work party brigade assembled at the Pavilion Café at 10:00, Saturday 30th of July for a good morning’s FOMBLing. Armed with little more than a couple of spades and a wheelbarrow, Alec and Yusef fought hard to win back a section of Leamington Walk from the ever encroaching turf, reclaiming it for public use. The displaced turf was rehomed in a more suitable location, making an unsightly mud patch near the Pavilion green once more. Heather demonstrated some Olympic scrubbing skills and transformed two signs – a “Bruntsfield Links” street sign and a “Play Around Edinburgh” sign by a playpark – from barely visible to sparkling masterpieces. Bob had the task of weeding out the chessboard on Bruntsfield Links. After carefully analysing the positions of the weeds, he made some bold opening moves and put himself in an advantageous position just before elevenses. Unfortunately the weeds were taking a rather long time to decide their next move, and the match was adjourned, until Bob returned in the afternoon to crush his vegetative opponents. Meanwhile, M.A. and Derek helped to ensure the Meadows stay fresh into the future by sowing grass seed on bare patches near the Pavilion Café. See if you can spot the patches in the coming weeks. 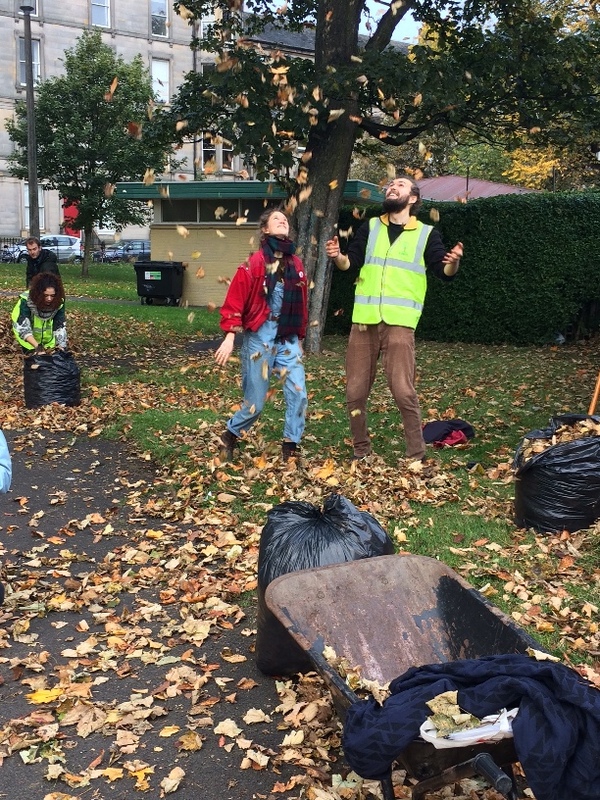 Clare took up the hallowed role of litter picker – traversing the great plains of the Meadows, keen of eye and swift on the draw, she rained sweet justice down on litter of all sorts, making our park a cleaner, nicer place for everyone. Andy spent the morning wrestling with a plastic self-assemble storage shed. Things were looking pretty grim for a while, and in the end it was close, but, ultimately, man triumphed over shed. This shed will hold all of FOMBL’s lighter tools, while Peter Davidson, South Edinburgh Park Ranger, has kindly donated us a wheelie bin for the heavier ones. Hurrah for storage! Peter also did some fine work on the Links, putting wood chippings down around some trees to combat some perseverant weeds. Martin started out trying to locate a water supply to enable the grass seeders to water their plantings. He found an outside tap on the rear (south) side of the pavilion. It was obstructed by piled up junk and by overgrowing vegetation. He restacked the junk (more work here for a future work party) and cut back the vegetation. He then headed towards the east end of the Meadows, and came back past the tennis court hedge, litter picking as he went. At around 11:30 we adjourned for a well-earned cup of tea/coffee and some scrumptious banana cake prepared by the lovely Eleanor of Edinburgh Student Housing Cooperative. All in all, a successful day caring for our local patch, and rewarding for all involved. Saturday 25 June turned out to be another great working party, following some rain fall on Friday night. We had 13 volunteers - some regulars and some new faces. We got to work straight away. While Heather and Kay spent time tending to the panoramic notice boards and picking up litter - a job that is always needed- David, Tanya and Eileen did a great job edging paths along Boroughloch Walk. As you can see from the picture attached, it looks much better. As like last month, Bob did some tree feathering near Leven Terrace while Martin worked hard on a large tree on Leamington Walk. Andy is still working his way through the large pile of earth in East Meadows and with help from M.A managed to fill lots of holes throughout the Meadows. Alec, Derek and I spent the morning pulling weeds and overgrown grass from the central bed at the Bruntsfield Hotel end of Leamington Walk. Anyone who walks that way will most likely know how bad it was getting. We managed to fill two bags of roots, weeds and clippings. This was work that Eileen and I started last month. Derek finished at coffee break, and Alec and I continued. The Park Rangers will be barking the area sometime soon to avoid the overgrowth again. Robin also popped along to help out for a short while with litter picking. After a well earned coffee break and a chat, we got back to work. Derek, Martin and Heather left us to it and we all continued on our tasks. Our next FoMBL Working Party will be held on Saturday 30 July. As always, all members are welcome and any non-members are encouraged to come along and see what we do. Meeting place remains at the Pavilion Cafe at 10am, where we are lucky to receive £1 coffee on our break. I hope to see many of you next month! This morning I formally handed over organisation of work parties to Tammy Rudduck, who nobly gave up her time on a Saturday when she was actually in the middle of moving house! Commiserations and warm thanks to her partner, who no doubt bore the brunt of all this. Tammy now holds the keys to the Pavilion shed. She gave out the necessary tools and organised the work. Ann Leith and I worked on the two noticeboards at the top of Jawbone Walk: the locked board had a lot of graffiti on the back, which we managed to remove, using the special fluid given to me a while ago by Mike Shields. I have now left it stored in the Council shed behind the Pavilion, for future reference. It did the job well, in the end, after quite a struggle! We also worked on the front, and on the information board on the path opposite. Ann then had to go. After the break Suzanne Mackenzie and her two boys, Jacob and Connor and another young friend Connell joined me in cleaning the information board at the ‘crossroads’ of Middle Meadow Walk and North Meadow Walk. The boys also picked up litter and handed out FoMBL leaflets to passers-by, most efficiently while Suzanne was finding somewhere to rinse our cloths the boys took turns in reading out the now clean (and legible) information board, with its history of the Meadows. They were intrigued to discover that it had previously been a loch. We then went back to the Pavilion, and did some more work on the noticeboards there (the boys were perfectionists: Ann and I hadn’t been efficient enough!). When they were finally satisfied, we adjourned to the Helen Acquroff Drinking Fountain nearby (see the last newsletter), and though we didn’t have the proper tools, somehow managed to remove a lot of weeds that were clogging up the surrounding paving. Ideally this should be done professionally and re-pointed. But in the meantime, the boys found that litter-pickers actually made good tools for cleaning out the gaps between the paving slabs. Many thanks indeed to them for all their hard work. As well as the great work accomplished by Heather, Ann, Suzanne and the boys, we had two new volunteers today, David and Tanya (who are now members), who assisted Bob in feathering trees over at Leven Terrace and picking up sticks. Derek also helped with this feathering in the morning. 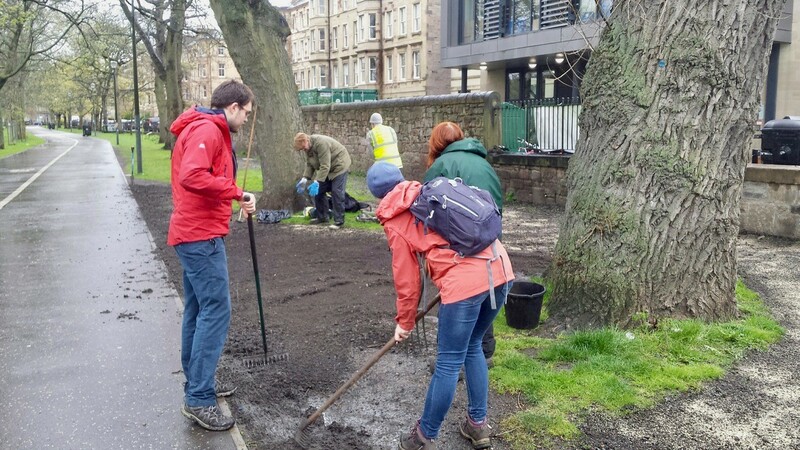 Irene and I tended to some garden beds on Bruntsfield Links in the morning and attempted to uproot some weeds and sycamores in the central garden bed at the top of Bruntsfield Links. It has been quite overgrown for some time and will require some more work yet, before it looks presentable again. Andy and Yusef did an amazing job relocating soil from the big pile in East Meadows and filling some gaps near the Pavilion Café. This work was required for the upcoming Meadows Festival this weekend. We all enjoyed a lovely break together with a cheap cup of coffee at the Pavilion Café, with thanks to Amanda, and finished up at 12.30pm. Many thanks to all our volunteers and we hope to see everyone again next month – Saturday 25 June at 10am. We meet at the Pavilion Café. Everyone is welcome!